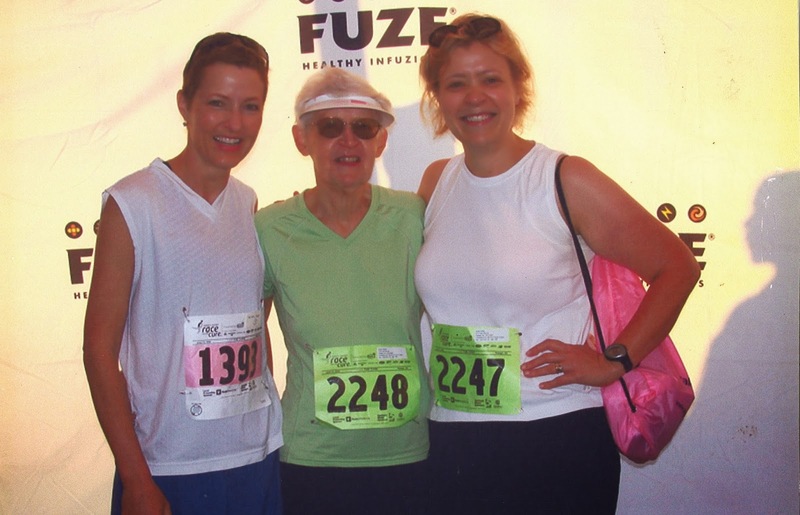 Esther Wenzel poses with her daughters after they completed a recent “Race for the Cure” run to benefit Breast Cancer Awareness. Esther Wenzel has always been on the go. She’s been a cartographer, computer analyst, mother, homemaker and bank teller; She’s lived in Colorado, California, Ohio, Wisconsin, Pennsylvania and North Carolina, and she’s had one habit that has helped carry her through all of it: Running. At 83 years old, Wenzel still makes running a top priority. She runs at least three times a week—pushing an hour each trip, walks ½ mile each day from her home at Springmoor Life Care Retirement Community to visit her husband at the Health Center, and typically participates in two 5k charity runs a year. She has done the “Race for the Cure” for breast cancer awareness nearly every year to support friends and family who have suffered from the disease. Wenzel is among thousands of seniors who are taking the reigns on aging. Active Aging Week—which extends from Sept. 22 through Sept. 28—was established by the International Council on Aging to promote the efforts of motivated seniors and organizations that value staying, active, healthy and engaged. Springmoor Life Care Retirement Community will celebrate Active Aging Week next week with a series of events and programs: On Monday, smoothies will be served and a scavenger hunt will take place; On Tuesday, Springmoor hosts an “Active Aging Week” Celebration Dance; On Wednesday, a healthy luncheon of turkey burgers and turkey dogs will be served, and on Thursday, Springmoor will hold its annual Health Fair, which will showcase healthy initiatives and provide residents with tools to take better charge of their health. For more information about Springmoor’s plans, check out Health and Fitness Director Kari Richie’s blog. Wenzel says that she gets the motivation to stay active by making sure that running remains a consistent habit. When she is out running around the beautiful Springmoor campus, she says that she often looks at mailboxes, counts them and pushes herself to run farther each time. And for Wenzel, age is just a number: “I don’t feel old until I look in the mirror,” she said.